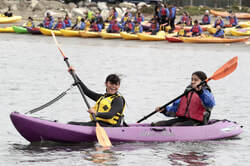 If you are looking for an educational, but fun and active outing for your 5th - 12th graders, kayaking is the natural choice. Our guides will provide safety and group management while teaching them about all the marine life that surrounds them. Our youth group tours have higher standards than anyone else. A Summary of Safety and Certificate of Insurance can be provided upon request. We offer a special discounted rate for weekdays from September through May excluding weekends and holiday weekdays. 16 person minimum. Tours will range from 2 to 2. 5 hours depending on the grade. Includes all gear + wetsuits. Youth group reservations require 2 weeks notice for a full refund unless we cancel for safety reasons. ​See full cancellation policy and weather links.